The Honda WR-V and the Hyundai i20 Active share one thing in common. 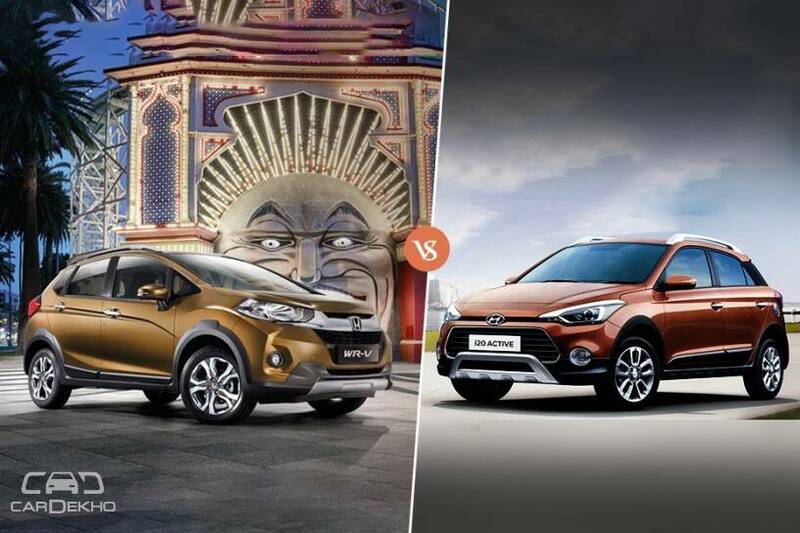 Both are crossovers that are based on their respective hatchback cousins - the Jazz and Elite i20. The Honda, however, has an SUV-like presence thanks to its high bonnet, flat nose and thick chrome grille that seems to have been inspired by the BR-V. Meanwhile, the Hyundai is simply a jacked-up hatchback with roof rails and plastic cladding. So, which of these two return better performance and efficiency numbers in real-world conditions? Here are the results from our road tests. The diesel variants of the Honda WR-V are powered by a 1.5-litre, 4-cylinder i-DTEC engine which produces 100PS of power and 200Nm of peak torque, which is 10PS more and 20Nm less than the Hyundai. Between the two, it’s the Honda which is quicker to 100kmph from a standstill taking 12.43 seconds compared to the i20 Active’s 13.3 seconds. The higher torque of the i20 Active helps it plug traffic gaps with ease, making it a better car to drive in the city. However, the Honda takes marginally longer to gather speeds, which may be due to taller gear ratios. The shorter ratios of the i20 Active help it post better fuel efficiency figures than the WR-V in the city. Out on the highway, though, the WR-V’s taller gearing helps it pip the Hyundai in terms of mileage figures. More on that later. The Honda WR-V beats the i20 Active in braking tests too. While braking from 100-0kmph, the Honda covered lesser distance (41.90m) compared to the Hyundai i20 Active, which took 4.97m more to come to a complete halt. However, we must point out that the i20 Active that we had tested had over 40,000km on the odometer and worn out brakes. Hence, the figure is not representative of the car’s actual braking performance. For the record, both cars get ventilated front discs and rear drum brakes and anti-lock braking system (ABS) with electronic brakeforce distribution (EBD) (standard across all variants) as standard. The company-claimed mileage figures for diesel versions of the Honda WR-V and the Hyundai i20 Active read 25.5kmpl and 21.19kmpl, respectively. Due to shorter gear ratios and higher torque, the i20 Active was able to return 16.36kmpl in the city whereas the Honda managed 15.35kmpl. As we mentioned before, the Honda’s taller gearing helped it return an impressive figure of 25.88kmpl. The i20 Active, on the other hand, managed to deliver a respectable 23.8kmpl! Going by these figures, it’s clear that the Hyundai i20 Active makes for a better choice for buyers who’ll be using it for city commutes whereas the WR-V makes more sense for frequent highway drivers. Having said that, both cars have their strengths and neither outperformed the other by a significant margin in any of the tests we conducted.